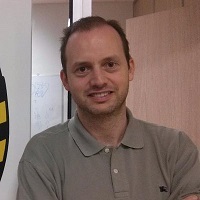 a Spanish industrial engineer with a passion of software development and DevOps, currently affiliated with JFrog  , where he integrated the acquired Conan C/C++ package manager into their DevOps toolchain products such as the binary repository manager Artifactory . Diego Rodriguez-Losada holds a Ms.C. in Mechanics and Ph.D. in Robotics, and was associate professor at Universidad Politécnica de Madrid (UPM) and researcher at the Intelligent Control Group at UPM. His main research interests focused on mobile robotics, robotic mapping, specially on simultaneous localization and mapping (SLAM). He published along with Pablo San Segundo et al. on bitboards  and an efficient bit-parallel maximum clique problem solver .